What just a minute…you mean the Secret Service allowed a forklift to drive up to the White House and nearly get away with thousands of dollars? They’re been slacking lately, with the fence jumpers and everything, but this is ridiculous! Actually, the incident happened in the town of White House, Tennessee. According to police and FOX 17 news sources, two suspects took a forklift from Bojangles restaurant to The Farmers Bank on Highway 76, directly across the street. The forklift drivers caused damage to the bank, estimated around $50,000. Police said the would-be thieves did not get away with the money. So what scared the robbers away? 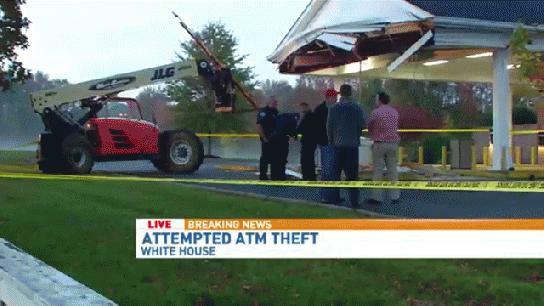 It just so happened that an unsuspecting bystander just happened to drive up and saw the forklift trying to extract the ATM machine. Once they saw the car, the thieves immediately fled the scene. The investigation is still going on, and surveillance video is being reviewed. It was not immediately clear what type of forklift the suspects used, or what type of damage happened to the forklift. As with most accidents and criminal action involving a forklift, OSHA (Occupational Safety and Health Administration) will most likely conduct their own investigation. Forklift security procedures are an important part of OSHA compliance, and CertifyMe.net ensures you and your co-workers are provided all the information to enhance safety, avoid accidents and enjoy a better working environment. Plus, every person who takes our forklift training is guaranteed a 100% pass rate (course work can be taken on anyone’s schedule or learning curve), and OSHA papers can be printed out immediately – that means no downtime after training! Call our forklift training experts at (888) 699-4800, or check out the CM contact page for more information. Thanks again for visiting the CM blog!